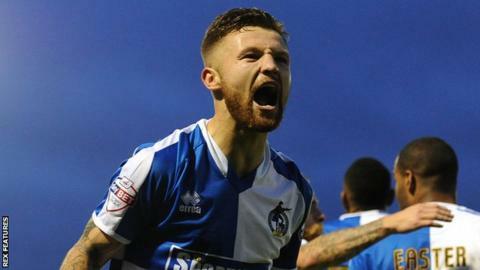 Matty Taylor's second-half double saw Bristol Rovers banished the memory of their FA Cup loss to non-league Chesham United by beating Carlisle. He had an early shot saved while Jermaine Easter also went close. Taylor broke the deadlock with a close-range shot at the far post after Chris Lines had crossed into the box. Carlisle's David Atkinson had a free-kick deflected just wide by teammate Mark Ellis before Taylor sealed the win with a low left-footed shot. The victory, only the second at home in the league this season for the Gas, lifted them up to eighth in League Two, one place above Carlisle on goal difference. Match ends, Bristol Rovers 2, Carlisle United 0. Second Half ends, Bristol Rovers 2, Carlisle United 0. Tom Parkes (Bristol Rovers) is shown the yellow card for a bad foul. Substitution, Bristol Rovers. Ollie Clarke replaces Chris Lines. Substitution, Bristol Rovers. Nathan Blissett replaces Jermaine Easter. Goal! Bristol Rovers 2, Carlisle United 0. Matty Taylor (Bristol Rovers) right footed shot from outside the box to the bottom right corner. Attempt saved. Jake Gosling (Bristol Rovers) right footed shot from the left side of the box is saved in the top centre of the goal. Corner, Carlisle United. Conceded by Lee Brown. Tom Miller (Carlisle United) wins a free kick in the attacking half. Substitution, Bristol Rovers. Jake Gosling replaces Cristian Montaño. Substitution, Carlisle United. Charlie Wyke replaces Alex McQueen. Hand ball by Derek Asamoah (Carlisle United). Mark Ellis (Carlisle United) wins a free kick in the attacking half. Attempt missed. Antony Sweeney (Carlisle United) header from the centre of the box misses to the left. Corner, Carlisle United. Conceded by Tom Parkes. Corner, Carlisle United. Conceded by Stuart Sinclair. Goal! Bristol Rovers 1, Carlisle United 0. Matty Taylor (Bristol Rovers) right footed shot from the right side of the six yard box to the bottom right corner. Assisted by Chris Lines. Attempt missed. Mark Ellis (Carlisle United) right footed shot from the centre of the box is close, but misses to the right. Substitution, Carlisle United. Jabo Ibehre replaces Joe Thompson. Substitution, Carlisle United. Steven Rigg replaces Angelo Balanta. Foul by Chris Lines (Bristol Rovers). Attempt blocked. Derek Asamoah (Carlisle United) right footed shot from outside the box is blocked. Attempt missed. Stuart Sinclair (Bristol Rovers) right footed shot from outside the box is high and wide to the left. Attempt saved. Jermaine Easter (Bristol Rovers) right footed shot from outside the box is saved in the centre of the goal. Foul by Joe Thompson (Carlisle United). Mark McChrystal (Bristol Rovers) is shown the yellow card for a bad foul. Angelo Balanta (Carlisle United) wins a free kick in the attacking half. Corner, Bristol Rovers. Conceded by Patrick Brough. Lee Brown (Bristol Rovers) is shown the yellow card for a bad foul.